Set the compass and sail towards perfection! Your boat is constantly bombarded by the tough-sea environment. Water, salt, and sunlight will damage the gel coat finish and cause it to oxidize. Oxidized gel coat looks dull and lifeless; it cannot be restored with a regular wax. Marine 31 All-In-One Gel Coat Polish & Wax features micro-abrasives that gently polish away light oxidation, restoring the gel coat's original luster. These abrasives, in combination with specialized cleaning agents, remove any stains that scar an otherwise perfect gel coat. With Marine 31 All-In-One Gel Coat Polish & Wax, the impressive cleaning power is only part of this product's ability. All-In-One Gel Coat Polish & Wax leaves behind a durable layer of wax protection that has been fortified with the most powerful UV absorbers available. The absorbers protect the gel coat from the sun's damaging ultraviolet radiation. In fact, UVA and UVB radiation is the number one cause of oxidation on your boat's surfaces. With the highly reflective nature of water, your boat is under constant attack! Not only does the wax protection in Marine 31 All-In-One Gel Coat Polish & Wax work hard to prevent oxidation, it creates a highly water repellent barrier. Because it polishes the surface smooth as it protects, bacteria, anemones, mold, mildew, and sea creatures have nothing to attach to. Keeping your hull clean and protected will help it glide through the water with ease, reducing drag and fuel consumption. Oxidation and staining is a normal part of sea life. Polishing your boat's gel coat with Marine 31 All-In-One Gel Coat Polish & Wax annually will remove any light oxidation, restore your boat's luster, and prevent further oxidation form occurring. 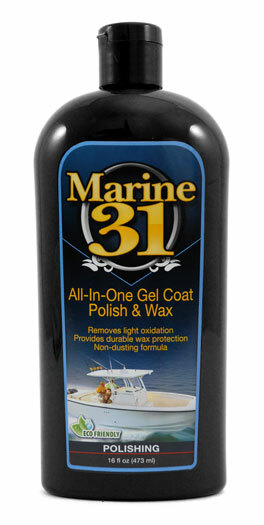 Marine 31 All-In-One Gel Coat Polish & Wax is friendly to the environment. A Word From The Captain's Chair: For more protection you can apply Marine 31 Gel Coat Carnauba Wax & Sealant directly on top of All-In-One Gel Coat Polish & Wax. Maintain your boat's gel coat with any of Marine 31's carnauba based washes for a powerful system that has been engineered to keep your boat looking its best!